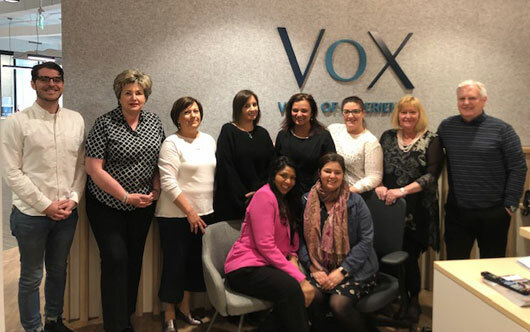 Baxter Media recently dropped in to visit VoX International at their new offices in Toronto. Situated on the Lake (Ontario), the brand new offices are as far downtown as you can get. We had a chance to sit and think in the Collaboration Room and play with the up/down buttons on their new desks. Overall it was a very productive get together. In the picture (l-r) are Braden Rosner, Rosalyn Hunter, Gerlinde Perera, Hannah Choat, Wendy McClung, Ashley Rochefort, Susan Webb, Paul Larcher. Seated, Rita Spizzirri and Emily McClung.